Less bling, more substance for the grandest of all Cadillacs. The Cadillac Escalade is as large as the notoriety that precedes it. This full-sized SUV was launched in 1999, following the Lincoln Navigator to the market by one year. But it is the Cadillac model, not the Lincoln, which has dominated the segment, spawning extended wheelbase, truck, and hybrid versions along the way. These days, the truck and hybrid variants are gone, leaving the two remaining designs to comprise the product line. 2016 Cadillac Escalade Platinum 4×4. 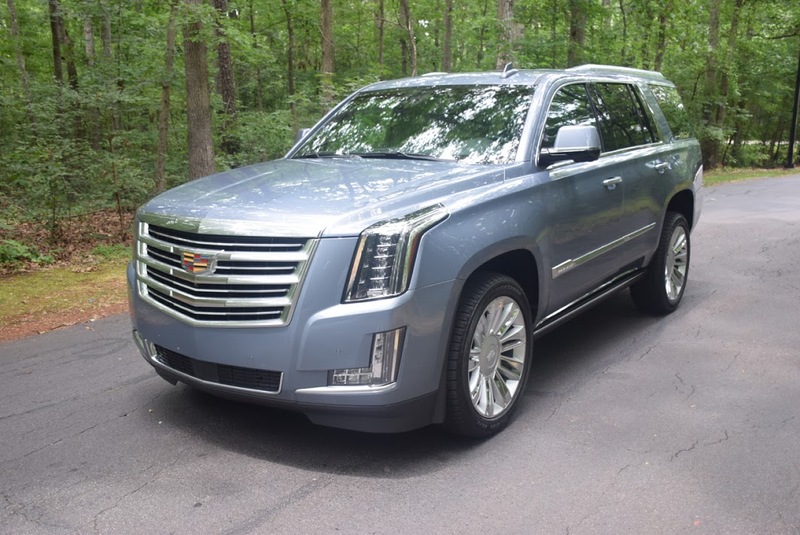 My test vehicle was a 2016 Cadillac Escalade Platinum 4WD, the top-of-the-line trim priced from $90,345 for the rear-wheel drive rendition or $92,945 for the four-wheel drive representation. Certainly, a more modest standard model can be had for a mere $73,965, but chances are you’ll find dealer lots crammed with other trims, including Luxury ($78,040) and Premium ($82,540) editions. Choose the four-wheel drive version and you’ll add $2,600 to the base price. Add in another $3,000 if you prefer the extended wheelbase (ESV) model. Yes, it is possible to top $100,000 when all is said and done, however, my test model came in at just under $95,000. Cadillac released the fourth-generation Escalade in 2015. As always, this model is based on GM’s full-size pickup truck platform. The Escalade shares its mechanical underpinnings with the GMC Yukon/Yukon XL as well as with the Chevrolet Tahoe and Suburban SUVs. One of the most important differences between the three model lines is that the Cadillac provides a 6.2-liter, V-8 engine while the Chevrolet and GMC are powered by a 5.3-liter, V-8. An important exception comes in the form of the Yukon XL Denali, itself powered by the larger V-8. Another difference is the transmission pairing — the smaller V-8 is mated to a 6-speed automatic; the larger V-8 is paired with an 8-speed automatic. Other significant differences are evident in two areas — design and technology. Indeed, the Cadillac Escalade features a striking frontal expression marked by an oversized, chrome-bedecked grille amplified by the latest version of the brand’s logotype. The grille flows into the hood, itself marked by distinct creases and sculpting. The headlamp assemblies are large, come with multiple stacked jewel-like lamps, and push up along the front end of the hood. A lower grille opening or air intake is offset by a pair of boomerang fog lamps. Together, the front lighting when lit provides a powerful over-the-top presentation demonstrating that this is no ordinary SUV. For the profile, Cadillac took the traditional slab-sided expression and has made it pop. Gone are the garish chrome-clad side mirrors, replaced with more tasteful color-keyed mirrors with a black base and a slender chrome trim divider separating the two. Subtle upper and lower character lines are present; door, door handle, window, and roof rail trim are also covered with a chrome-like substance. The biggest appeal, however, is in the wheels. The test model was outfitted with 22-inch chrome multi-featured wheels — in this case representing a nine double-spoke layout. At the rear, you’ll find a massive liftgate, itself hemmed in by narrow, but very long combination lamps. Stretching three feet along the back side, the lighting look is imposing if not a bit overwhelming. The liftgate itself is split by a chrome bar embellished with the Cadillac logo. This model has a single exhaust port, hidden away underneath and located to the right of the full-size spare tire. Cadillac presents the Escalade with seven standard seats or eight if you substitute the middle captain’s chairs with a folding bench seat. The rear seat holds three and is a split-folding design. Switches located on the right rear wall of the cargo compartment manage the second and third rows by dropping, folding and in the case of the middle seats flipping same. Access to the third row is easy whether you use the power-fold features or not. Slip behind the wheel of the 2016 Escalade and you’ll immediately be hit by a swirl of colors as both the instrument panel and the center console illuminate. This SUV’s instrument cluster features a 12.3-inch display, allowing drivers to choose one of two layouts supplying vehicle data with navigation, entertainment, and eye-popping 3-D vehicle imagery. You can customize your driving position by adjusting the pedals and steering wheel as well as shifting your seat. The Platinum edition takes driver comfort to its highest level as it is equipped with 18-way power adjusted seats with three-way massaging. Covered in semi-aniline leather, the front seats are comfortable and supportive — not once did I feel fatigued. The middle seats offer very good support, but not to the extent of the front bucket seats. Still, each seat comes with an inboard armrest and there is generous space between the two. The rear facing part of the center console supplies multiple controls including climate control, seat heating, as well as an auxiliary input port and DVD connectivity. My test model came with a pair of seat back displays for moving watching. A drop down display between the front seats extends that viewing to the third-row passengers. Cadillac provides a pair of Wi-Fi headphones for your listening pleasure. The third-row provides room for three, although tall passengers may consider it a penalty box. Not so much for legroom — it is sufficient, but for the slightly raised flooring. For some folk, that means your knees may block your view. Two cup holders are located on the wall of the driver’s side of the vehicle; a third cup holder is on the right side. Second-row passengers have in-door bottle holders and small storage compartments. The first-row passengers get the lion’s share of storage with two bottle holders each in both doors, two cup holders between the seats and a deep storage compartment under the armrest. That storage compartment has a neat feature — a cooling box you fill with ice and stuff a half dozen drinks inside. The only drawback to this nifty container is that there is no drain plug — you’ll need to scoop out your ice. A better approach would be to freeze one of your water bottles or bring along some blue ice to keep everything chilled. In any case, there is a switch located at the base of the center console to activate the cooling feature. This model offers multiple connectivity points. At the base of the console secreted underneath a moving panel is a 12-volt outlet and two USB ports. Two more USB ports are found in the storage compartment near the cooling box. At the base of the rear center console is another 12-volt outlet along with a 115-volt outlet. The rear storage compartment has yet another 12-volt outlet. Cadillac CUE…how do you do? CUE or Cadillac User Experience was first launched in 2013. These days, all Cadillac models are equipped with this infotainment interface, making Bluetooth connectivity, phone pairing, and a host of other features easy to use. The system is controlled by touch or hand swipes, by controls on the steering wheel, or through voice input. Sliding your finger across any of the controls manages same, including raising and lowering the volume. Step down the next two rows and the climate controls are operated in the same way. But let’s head back to CUE: on either side of the volume bar is the activation key to mute the system as well as a home key. The home key serves up more than a dozen app-like features, including audio, phone, navigation, weather, camera, traffic, and OnStar. Speaking of OnStar, when I was trying to discover (unsuccessfully) the password to the Escalade’s included WiFi hotspot, I pushed the OnStar button. An attendant immediately answered, greeted me, and provided the password. I’m a fan of in-car connectivity and having access to the Internet while on the road is a welcome benefit. One feature easy to overlook for Cadillac CUE is the “secret” storage compartment behind the face of the system. Touch the lower end of the unit and a door automatically lifts, providing room to hide your valuables. It includes a USB port surrounded by a blue light to connect your smartphone — an overhead light makes it possible to see around this otherwise very dark cavern. Take the Escalade on the road and you may feel as if you’re king of your dominion. The latest version is the most imposing of them all with its bold front fascia. Under the hood, the big V-8 gets the job done with ample power from start to highway speed. I’m not against engine boosting, but a normally aspirated V-8 pulls no punches and delivers no surprises. In other words, you get the amount of power you need without the attendant lag of a turbo or the added expense of a supercharger. Pairing this engine with an 8-speed automatic also improves efficiency, delivering upwards of 22 mpg on the highway. One thing you’ll notice immediately with the Escalade is just how quiet this SUV is. Every body panel, nook, and cranny must have been touched by Cadillac engineers to deliver a serene cabin. You already get a soft ride and with the seat heating and cooling feature plus massaging at work, you’ll find the Escalade more comfortable than any high-end settee. Yes, you’ll sense some body roll as you tackle the twisty roads — that’s to be expected with any high-profile vehicle. On the straightaways this SUV is a beast, picking up speed at a rapid clip. That it tows up to 8,100 pounds (7,900 lbs. with AWD) is a bonus. It also stops firmly, but then I had no more than four people inside and I wasn’t towing anything. When people come to me about a new vehicle, most have their minds already made up. All they’re looking for is validation. Usually, I share with them what I know about the vehicle and leave it at that. I also like to talk about the value proposition — whether a car is worth it or not. This is a sticky area as no car should be considered an investment. Instead, you should purchase what you want and can afford. Clearly, the Cadillac Escalade targets people with a high net worth, individuals who probably make about $250,000 per year and for them it isn’t a matter of saving money, but of seeing and being seen. In some ways, the Cadillac Escalade is a throwback to the days of large sedans such as the Fleetwood and the Eldorado. Both those models are long gone, but the spirit of each one is imbued within the Escalade and all its attendant delicious ostentatiousness, bling imagery, and cutting-edge tech features.